The Ashokan Water­shed Stream Man­age­ment Pro­gram awarded the Town of Wood­stock a $29,000 grant to cover par­tial costs to com­plete Habi­tat Map­ping for the Town of Wood­stock. The grant cov­ered hir­ing Hud­so­nia Ltd., a not-for-profit envi­ron­men­tal sci­ences orga­ni­za­tion, to com­plete field sur­vey and develop a map and report describ­ing the diverse habi­tats in the Town. The maps pro­duced will aide the town with plan­ning, devel­op­ment, and con­ser­va­tion deci­sions. Map­ping was com­pleted over a two-year period through the sum­mer of 2012. The maps and report iden­tify sig­nif­i­cant habi­tats and asso­ci­ated wildlife found within stream cor­ri­dors of the Beaver Kill, Lit­tle Beaver Kill, and Warner Creek trib­u­taries to the Eso­pus Creek. The Wood Tur­tle is a stream cor­ri­dor species of con­ser­va­tion con­cern and inter­est found in these drainages. See Hudsonia’s report and the Town of Wood­stock habi­tat map for more infor­ma­tion on con­serv­ing nat­ural areas in stream cor­ri­dors and wood tur­tles and their habi­tat in the Ashokan Watershed. 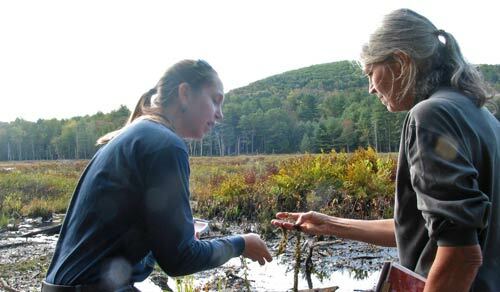 Researchers from Hud­so­nia take sam­ples from Yan­kee­town Pond, near Wood­stock. Photo cour­tesy of Vio­let Snow, Wood­stock Times.